Posted on November 30, 2014 by Hawaii's Local Buzz. With our free shipping offer, you can send your friends and family members crunchy macadamia nuts, flavorful coffee or healthy, raw honey from our family farm on the Big Island of Hawaii. Just enter the coupon code “Holiday2014” to receive free shipping on any order of $50 or more, sent to a U.S. address. If you’d like to send gifts to friends outside of the U.S., don’t worry — we have that covered, too. Use the coupon code “IntlHoliday2014” at checkout, and we’ll give you $11 off the cost of shipping any order of $50 or more. If you’d like to send gifts to multiple addresses, just re-enter the coupon code when you place each order. (Remember — each order needs to be $50 or more for the coupon code to be valid.) You can re-use the codes as many times as you like between November 1st and December 31st, 2014. 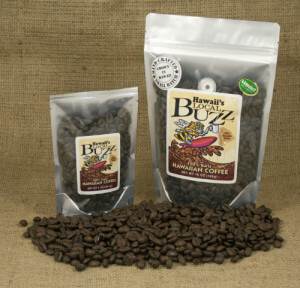 Hawaii’s Local Buzz is proud to offer the highest quality artisan foods from Hawaii. Our macadamia nuts, which are great for snacking and holiday baking, are dehydrated rather than roasted to preserve their delicate flavors. Our chocolate treats, such as our Chocolate Coffee Bean Crunch, provide a delicious end to your holiday meal, and our coffee beans, grown in rich volcanic soils, are robust and potent. Your friends and family members will also love our honey — send them the Winter Blend, known for its caramel-like qualities, or the uniquely Hawaiian Creamed Lehua. Contact Hawaii’s Local Buzz if you have questions about our holiday shipping offer or our perfectly gift-worthy products.